An alternate 1895... a world where Charles Babbage and Ada Lovelace perfected the Difference engine. Where steam and tesla-powered computers are everywhere. Where automatons powered by human souls venture out into the sprawling London streets. Where the Ministry, a secretive government agency, seeks to control everything in the name of the Queen. A murderous, masked gang has moved into London, spreading terror through the criminal ranks as they take over the underworld. as the gang carves up more and more of the city, a single name comes to be uttered in fearful whispers. When I saw this book on Goodreads, everything about it screamed, "Read me!" From the Doctor Who-ish cover (gas masks and overcoats, anyone?) 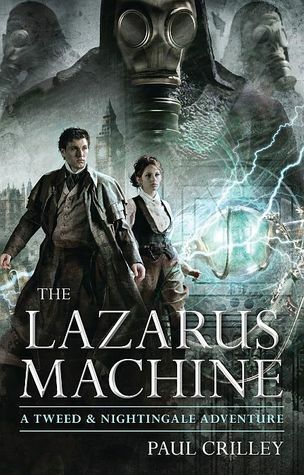 to the awesome premise (an alternate London with steampunk machinery in 1895) this book sounded like my dream come true. Not to mention the awesome references to Sherlock Holmes! But in the end, while this was definitely a good book, it simply wasn't great. As much as I love steampunk novels, I hate it when the machinery is confusing and difficult to understand. Perhaps other readers didn't have this problem, but I sometimes had trouble trying to understand the descriptions and imagine what was happening. Also, I could've used some more clear backstory, rather than the jumbled explanations that were thrown into the story. I had a bit of a problem with the writing style, too. It just didn't pull me in right away, and seemed bogged down with too many descriptions. It took a while for me to really get into the story. I'd have preferred more of the witty dialogue, which I greatly enjoyed, rather than the long rambling paragraphs. And sadly, I saw a plot twist at the end coming. It was rather obvious to me from the very beginning. Aside from these problems, however, The Lazarus Machine is very fun. I love how quirky the main character Tweed is. He's kind of like a mash-up of Sherlock and the Doctor - he's both clever and curious, and very socially awkward, which I loved. The other narrator, Octavia, was spunky and funny, and the rest of the minor characters added charm to the story. numerous times while reading it. So while I loved the characters and witty dialogue, I found the pacing to be slow and the descriptions a bit confusing at times. The Lazarus Machine isn't for everyone, but I would recommend giving it a try if you like BBC shows or historical steampunk novels.